Clearer. Tougher. Brighter. 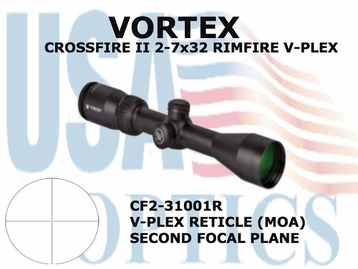 Our popular Crossfire riflescopes are completely redesigned and built to exceed the performance standards of similarly-priced riflescopes. Longer eye relief, a fast-focus eyepiece, fully multi-coated lenses and improved, resettable MOA turrets ensure optimal performance in the field. The hard anodized one-piece aircraft-grade aluminum tube is nitrogen purged and o-ring sealed for a lifetime of waterproof/fogproof performance. The Crossfires deliver - and then some. Tube Size - 1-inch diameter. Fogproof -	Nitrogen gas purging prevents internal fogging over a wide range of temperatures. 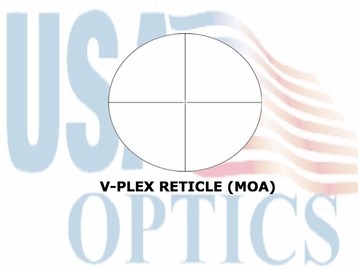 V-PLEX RETICLE (MOA) - A popular all-purpose hunting reticle intended for a wide variety of hunting applications.